* Contains interviews with 25 professional animal communicators and over 100 different animals and animal spirits. * Provides a thrilling glimpse of the possibilities of direct animal-human dialogue. According to Echo, an Arabian mare, "Humans are beings of love who have forgotten what love is and who they are." Along with a host of other animal communicators, Dawn Baumann Brunke gives animals like Echo a voice--a direct line of communication to the human mind. 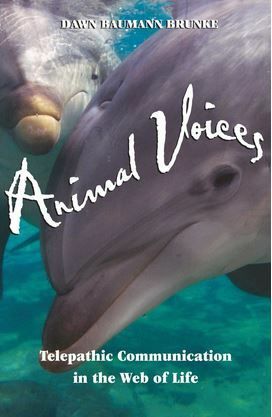 Through Animal Voices, the animal kingdom delivers a message about deepening our spirituality and reconnecting with the web of life. Our earliest ancestors had an ongoing shamanic dialogue with the animal kingdom, but this ability has been lost to most in the modern world. Brunke provides the techniques to reopen these connections, reminding us that when we are open to communication with animals, we are open to deeper layers of ourselves. The main contributors to this book are actual animals, who reveal themselves to be sentient beings with their own thoughts, emotions, and spiritual reasons for being on the planet. How Brunke overcame her initial skepticism and learned to hear their voices is a fascinating story. Throughout Animal Voices the author integrates her own reflections with those of the animals she interviews. The result is something that will delight animal lovers and force skeptics to reconsider their ideas about the nature of animal consciousness and the possibility of telepathic human-animal communication.